Yeah. That’s what I’m thinking too. It has been a WEEK. Pull up a chair, why don’t you? I’m starrrrving. Let’s order this bacon jalapeño cheese ball, this black bean dip and to be healthy, these vegetable spring rolls. Vegetables all around! They can make up for this entire pitcher of sangria that we are going to drink… ourselves. It’s worth it. Trust me. What first? Are you freaking that heck out that, oh, it’s February? ALREADY. What? How is this happening? Why is the world flying by my eyes while I sit and do nothing? And why do I have to be the cliche person who talks about how fast time is flying on the internet? The world will never know. Are you also totally missing McSteamy on Grey’s? It’s just not the same. And things are boring. I mean, I guess that happens after riding out a plane crash and surviving in the wilderness for a week or whatever, but still. Give me a little (believable) drama, Shonda. You already crushed my dreams by destroying Private Practice. I guess it’s sort of cool that Dana Gordon is playing some whacko character on the show but let’s be honest… she is nothing without Ari Gold. And now I miss Vincent Chase. Done any extreme Facebook stalking lately? Really… I’m sort of done with it. Until I find someone that I reeeeeeally want to stalk. Then it’s on. Will this ever not be a thing? Wait… is he really dating her? Whyyyyy. Unsubscribing is definitely a thing. A giant thing. Click click click… bye bye fake friends that post blurry pics of your kid using the potty for the first time. Just… no. That will never be a thing. Truth: I watched the Palladia special with Taylor Swift last night and loved it. I’m sorry, I can’t get on the hate train when someone is so passionate about what they do. I love passion. Passion is what I live for. I also couldn’t write a song to save my life unless it went to the tune of someone else’s already written melody. Plus, said written song would have an 85% chance being about bacon or glitter. No one wants to listen to that. Something mildly horrifying? I’m kind of waiting with baited breath for Safe Haven to come out. It’s not like I will see it in the theater anyway because I go to the movies like once every three years, but I romanticize the idea of Nicholas Sparks romanticizing the idea of everything in life. Then he deflates me, but whatever. Hopeless romantic for liiiiife. I also do this thing… where I lie on the couch and just refresh the popular page of instagram for about 20 minutes. I find this so interesting and truly? Entertaining. It makes me want to go to Greece and be a part of a beautifully filtered falling snowstorm on a lovely lit cobblestone street in some fancy city and eat weird and most likely very dry cupcakes. I’m not sure what that says about my life. One time as I refreshed it, I saw one of my blog recipe photos on there and was quite confused. Funny!! I put things on the internet for free soooo… who is the smart one here? hmmm. In the last week I’ve survived on a diet consisting mainly of dill-flavored triscuits and Advil cold and sinus. I don’t care anymore and this sangria is going to knock that out. Oh and actually? I definitely ate a few extra gummy vitamins for dessert this week because apparently I’m still not over doing that and it is what one does when they have a cold and there are no sweets in sight. I figured I could use the extra immune boost. Yesss. This was fun. Let’s do it again. Zest one of the blood oranges and combine it with the sugar in a small bowl. Rub the sugar and zest together with your fingers until fragrant. Juice four of the blood oranges (I simply did this by hand), discarding any seeds or pith. 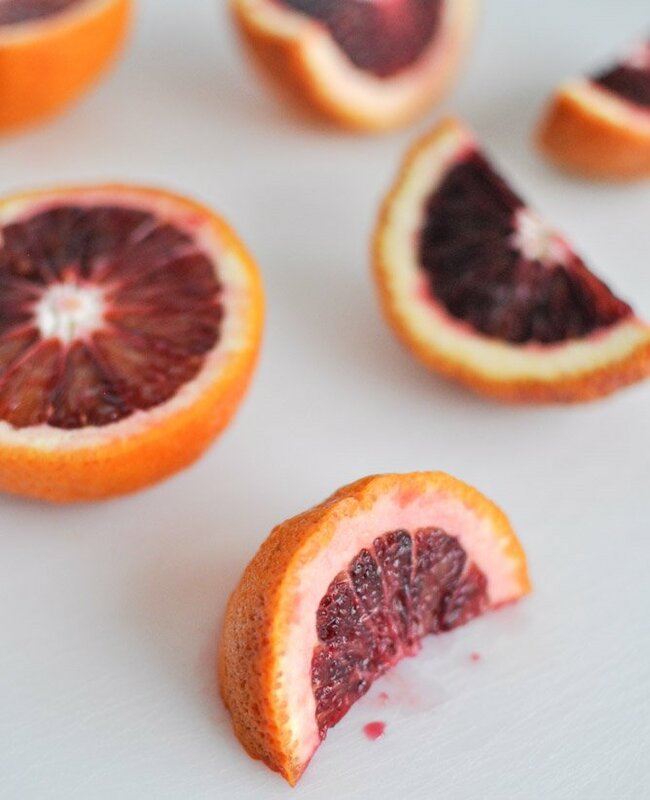 Chop the remaining blood oranges into pieces. 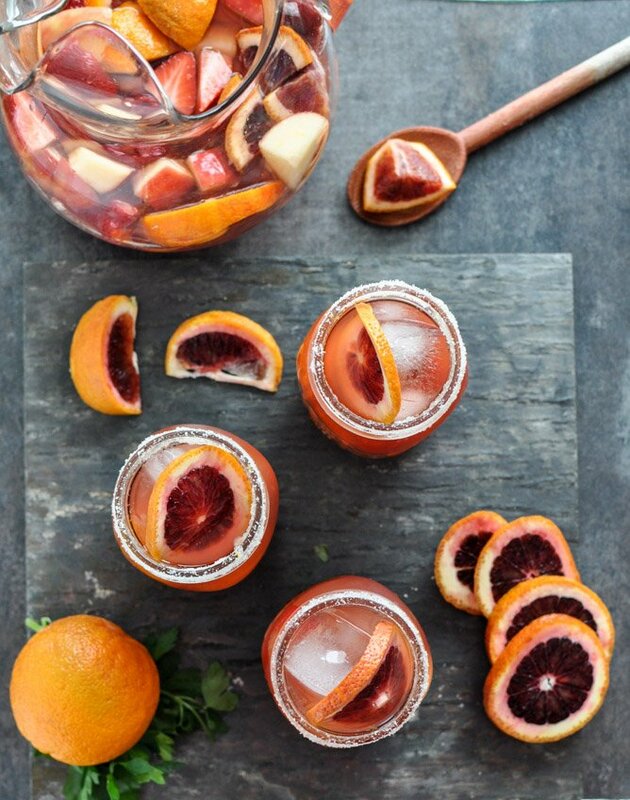 In a large pitcher, combine the wine, brandy, blood orange juice, club soda, apples, strawberries, raspberries and blood oranges. Stir well to combine. Place the orange sugar on a plate, then run a lemon, lime or orange slice around the rim of each glass. Dunk each glass in the sugar, coating well. 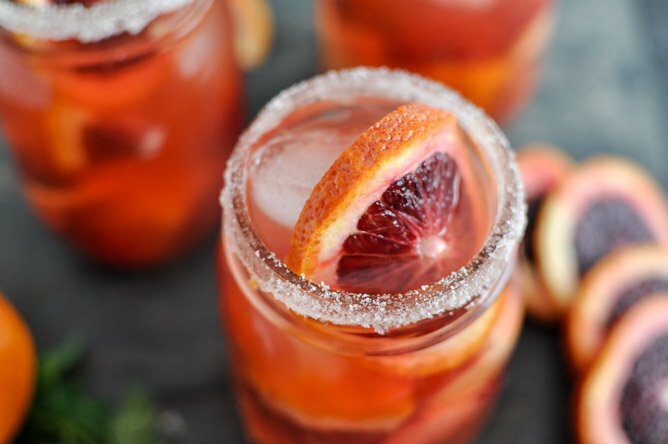 Fill each glass with a few ice cubes, then add some of the fruit from the sangria. 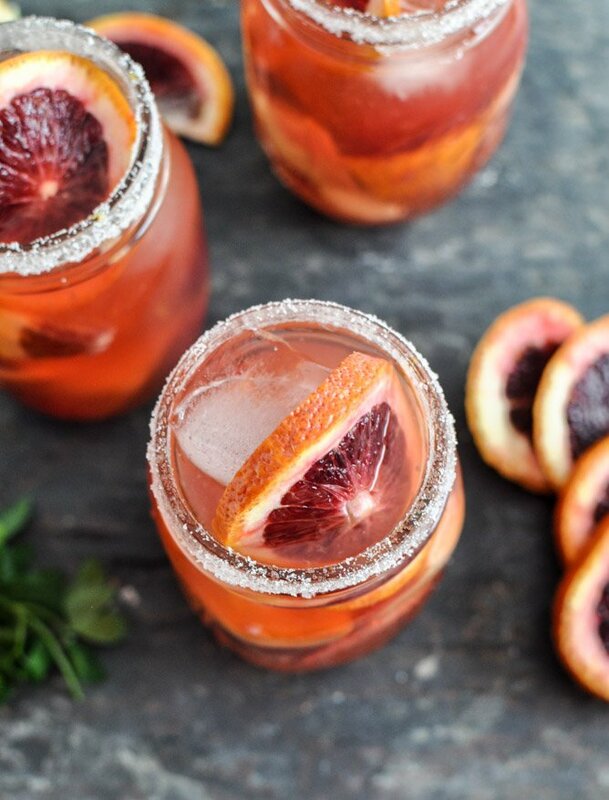 Pour the sangria into each glass and serve! Note: this definitely gets better as it sits, so you can make it ahead of time and store it in the fridge. January Favorites: Food + Fun. Chocolate Avocado Pudding. Yep, It’s a Thing. I saw this on tumblr like two years ago and had to try it. I finally did and it is seriously so awesome. I cheated and used frozen strawberries & raspberries, and bought the fresh squeezed blood orange juice from whole foods (I do not have a juicer nor the upper body strength to squeeze oranges). It tastes better overnight! I can’t wait to share this with my friends. This is all I want to drink forever! LOL! I love blood orange SO much! Looks amazing!